With unrestricted free agency opening this weekend, I am putting together a master list of the top free agents available on the market this offseason. Part one of my rankings covered the thin crop of centers hitting the market this weekend. Part two will cover a slightly deeper group of players, wings. I combined left and right wingers into this ranking, which will extend the total number beyond ten. Once again, the players are ranked on how popular they will be amongst potential suitors on July 1. Each player will get a short summary and those I see the Sabres targeting will get a little extra attention. Together with Ryan Suter, Parise forms the crown jewels of the 2012 UFA class. There are reports that he is attempting to work out a deal with the Devils, but I think he is smart enough to see what the other 29 teams may have to offer. An elite talent, Parise is going to command at least 47.5M on an annual basis with his new contract and may even break the $8M barrier. If the Sabres are to make an honest run at him, Tyler Ennis and Pat Kaleta will need to accept their qualifying offers and not reach for a more lucrative extension. Buffalo’s cap situation may prohibit them from chasing Parise, but he is the type of talent that will instantly make his new team better. A mercurial talent, Semin could possibly be the most talented player in the league if he gave a full effort each night. However, there are more reports of his shortcomings than his successes. Semin will likely get an offer from a team looking for a shot in the arm in terms of goal scoring. Some have pegged the Sabres as a suitor but I fear that some of his more “typical Russian” characteristics wouldn’t work well under Lindy Ruff, in the Sabres room and alongside their newest toy, Mikhail Grigorenko. When the news broke the Shane Doan would indeed be testing the free agent market, things got a bit more interesting for teams looking to find the ever so valuable intangibles. Depending on where he signs, Doan will round out a top six or provide an above-average solution on a team’s third line. Since he plays such a great two-way game, there will be plenty of teams knocking down his door. Based on what he brings to the table, I’d almost be more interested in the Sabres taking a stab at him instead of Parise. The Sabres could use more help on the right side and a $5M hit is more manageable than a $8M hit. The second round of player grades will focus on Thomas Vanek, Jason Pominville, Derek Roy, Drew Stafford, Jochen Hecht and Brad Boyes. These six players are major parts of the core, plus Boyes, and make up a major portion of the Sabres’ top six. Pominville was named the team MVP and was the leading scorer with 30 goals and 73 points. Outside of his dominant years playing the wing with Danny Briere, this was the best hockey I have seen Pominville play. He was active in all three zones, played consistently all year and was heads and shoulders better than any other forward on the Buffalo roster. While Pominville’s second half was somewhat quieter than his first half, he still remained a steady force offensively. I would credit his slight regression on being separated from Thomas Vanek. Regardless, Pominville embraced the captaincy and built a nice standard to try and surpass for next season. Comparing Vanek’s first half play to his second half play is like comparing Kate Upton to taking a stick in the eye. Vanek was brilliant over the first 41 games of the season. He was flirting with the league leaders in goals and points for some time before tailing off as the season progressed. A lot of that had to do with some lingering injuries that he refused to elaborate upon. I think his struggles can also be tied to moving him away from Jason Pominville. Vanek has always been somewhat enigmatic. At times he can be an unstoppable force and then completely invisible for stretches after. He basically enjoyed a tremendous first half, followed by a disappointing second half plagued by injury. I give him credit for refusing his injuries to be an excuse for his play. Getting Vanek a steady center to feed him the puck should be a top Darcy Regier’s to-do list. Derek Roy and Drew Stafford each reversed their ugly first half play with some strong hockey during the stretch run. Roy’s hamstring injury may have lingered during the early portion of the year before fully healing. However, some of his uninspired efforts didn’t seem to be caused by the lack of physical ability. After taking a look at a few of the bright spots for the Sabres this season, here are a few of the lowlights from the up and down season that saw the Sabres fall short of a playoff berth. By no means do I feel that injuries are the reason for Buffalo’s poor showing this year. But I certainly think they played a part in the downfall. I place this first because I’m tired of talking about it, so I want to get it out of the way. It is obvious that injuries played a role in the Sabres’inability to defend and produce consistent offense at various points throughout the year. For example, having Paul Szecechura centering your top two scorers isn’t an ideal situation. The same can be said for needing to dress Derek Whitmore and Marcus Foligno for their NHL debut on the same roster as T.J. Brennan and Brayden McNabb. The reason injuries can’t be pegged as the only reason for Buffalo’s struggles is that many of their regulars remained in the lineup. Derek Roy and Drew Stafford’s stagnant first half had little to do with other players being injured. The same goes for Ville Leino and Brad Boyes – although those two did miss some time due to ailments. I think the only major issue that Buffalo couldn’t overcome was the way their defense was affected by the injury bug. By forcing Mike Weber into big minutes, while Brennan, Joe Finley and McNabb also took regular shifts, the Sabres were obviously operating with lesser talent in places where they needed strong players. I have to think the defensive strategy did suffer at times when the injuries were really bad, but that doesn’t excuse the inability of some of Buffalo’s core to perform at an adequate level. One piece of criticism that I’ll never deflect from Lindy Ruff is how he treats his lines. He is far too impatient with the production of some and far too loyal to others. Luke Adam, Jason Pominville and Thomas Vanek were terrific to begin the year, but the line was broken up by the end of November. Those three players spent the rest of the season bouncing between different lines and experiencing different levels of success as the season progressed. Adam ended up in Rochester because he couldn’t find traction after the success he had with the team’s top two scorers. Ville Leino and Brad Boyes are also part of this conversation. After proving he wasn’t a capable center, Leino was bounced around every single line on the team before ultimately settling on the wing with Derek Roy and Pominville. That was in March. Leino had an ugly season and didn’t justify his paycheck. However, you have to wonder if he had been given a fair chance to develop some chemistry with two linemates that his numbers may have been better. Showing little to no trust in the players he groups together is one of Lindy Ruff’s greatest faults. I feel that he did more harm than good this season with the choices he made regarding who his players skated with. Enroth makes this list not for his play, but the way he was utilized. Or should I say, underutilized? After a great stretch of hockey last year, Enroth stayed hot in the fall working in tandem with Ryan Miller. He took over from Miller when Buffalo’s starter was injured and things began to head downhill. As the team deteriorated, as did Enroth’s game. He hadn’t won a game since November entering a stretch of hockey that saw him get a rare start on a back-to-back set. His losing streak is still intact heading into 2012-13. Enroth is a very capable backup, but he needs to be used properly. Sitting him on the bench to get pickled will do nothing for his development or his impact on the team. Miller was called to start 30-straight games yet again, it is a situation that needs to end one day. One day soon. Buffalo’s pair of $4M+ wingers combined for 16 goals. You wouldn’t pay a single player their combined salary to score 16 goals. Both had their own types of let downs, but I would say Boyes was a bigger bust. Boyes did fall victim to playing on the fourth line, which seriously choked off his offensive output. However, he did see plenty of time on Buffalo’s stagnant power play and didn’t pick up many points there. Despite his impressive start last spring, Boyes has been a disappointing player during his time in Buffalo. As for Leino, there are a number of things he does quite well. His puck control is phenomenal and he makes some strong plays in the offensive zone. However, the scoring wasn’t there. Why? I feel that Leino’s adjustment period was longer because of being expected to play center and his general style of play. Add in the fact that he found himself playing nearly every position on every line the Sabres put out this year. Still, he wasn’t the player they expected or needed him to be. For $4.5M, that simply can’t happen. To think I thought all would be better when Brian McCutcheon moved on. I was way off. The Buffalo power play remained streakier than generic Windex and failed to be a difference maker at numerous times during the season. For the second-straight season, the Sabres failed to figure out how to enter the zone properly; relying on that idiotic drop pass and flat footed attacks. The organization acquired a premier point shooter, but he wasn’t used as such. Rather than build their attack around Christian Ehrhoff, the Sabres treated him as just another player and it showed. The numbers may not back up all of my claims regarding the power play, but an eye test would show that this unit was in desperate need of an overhaul. Perhaps Scott Arniel is interested in coming back to reprise his role from 2005-06. The first two trade deadline analysis posts focused on Paul Gaustad and Drew Stafford. Today’s will take a look at Brad Boyes and how his final days with the franchise may be spent. Brad Boyes represents the first major step in the Pegula era. Boyes was acquired at the deadline without needing to send money out. It was a straight acquisition of a player expected to help the Sabres’ playoff push. Since being acquired, Boyes has enjoyed a terrific early run, a dismal playoff showing and now a nearly invisible regular season. A great many have piled on Boyes, accusing Darcy Regier of acquiring a useless winger who makes too much money. What they are forgetting is how key he was for the team during the stretch run. 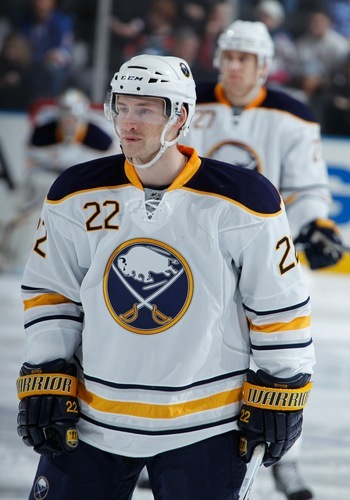 Boyes’ contributions played a large role in the Sabres sneaking into the playoffs last season. While his cold streak began at the very end of the regular season – and has continued almost a full calendar year – he was a pivotal player for a good portion of February, March and April. Of course, all of that production has disappeared and he is now an afterthought on a team over-saturated with second-line wingers. While Boyes possesses some traits that make him an attractive option for many teams, his lack of production has destroyed any sort of value he may bring on the trade market. One way or another, Bard Boyes will be wearing a different uniform next season. The question is; can the Sabres get some return for him before losing him? It is my contention that grabbing a fourth-round pick at the deadline for Boyes would not only be fair return for the winger, but it would ultimately be an equal trade for everything that Regier has done since last February. Remember, Boyes was traded for a second-round pick which was all but replaced by Calgary in the Regehr trade. The Sabres sent their fourth-round selection to the Islanders for Christian Ehrhoff’s negotiating rights. Buffalo could fill that void if they are able to find a trade partner for Boyes. Keep in mind that Boyes is not a former 40-goal scorer on the downside of his career. He is caught on a roster with an abundance of offensive talent and has been bumped down the depth chart for a host of reasons. His lack of production is alarming, but putting him in a situation where ice time will not be a premium will surely spark his goal scoring touch. Teams like Minnesota, Los Angeles, Colorado and Nashville are all in a situation where a scoring winger could do them good. Depending on the type of investment they wish to make will determine what kind of player those teams chase. I would have to assume Boyes is on their radar, at the very least. Given the thin crop of wingers expected to be available, there are surely going to be a few teams seeking his services. Expecting to receive anything higher than a fourth seems a little foolhardy to me. The market is thin and the potential to steal picks is certainly there, but Boyes’ lack of production this year has to be concerning for any team that will be looking closely. Having the ability to replace the pick they lost to acquire Ehrhoff would not only mean that Boyes helped them make the playoffs, but that brining Ehrhoff on came with a minimal loss. What Regier will need to determine prior to the 27 is if dropping Boyes from the roster will have any affect on the team as the year winds down. Boyes is getting time on the power play and is seeing time on the wing and at center. With a minimal chance of making the playoffs, there is no reason to hold onto a winger/center who has been forced down the depth chart. Keep an eye on the playoff teams – or those just on the bubble – who are in need of some secondary scoring. These will also be teams who could be interested in Drew Stafford, but the price for Boyes will be significantly lower than for Stafford. The Sabres are in a situation to sell an affordable piece (in terms of return) before losing him for nothing in July. Even selling Boyes for a loss will be a small victory. As the Rochester Americans prepare to open training camp, and the Buffalo Sabres pare down their roster, the battle for the remaining roster spots is becoming clearer. Ales Kotalik's prowess in the shootout may earn him a spot on the final roster. Thomas Vanek is a prime candidate to be the Sabres' next captain. 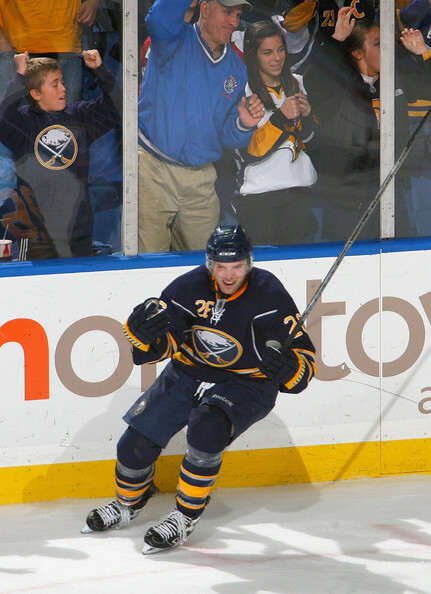 This is part four in a series previewing the Buffalo Sabres 2011-12 season. Part four focuses on the wingers. Read the previous three entries here. Darcy Regier has a knack for acquiring wingers. It probably has a lot to do with the league-wide overabundance at the position. Still, the Sabres have a stockpile of talented wingers entering training camp this week. There are eight openings available and at least ten players vying for a spot on the opening night roster. Based on the salary figures – the Sabres are still $3.5 million over the cap – the projected depth chart is fairly easy to lay out. There are a handful of players who a prime trade candidates, but without anything more than vague rumors it is unfair to speculate who will be part of the organization in a few weeks. Although the top four wingers are likely locks, the remaining four positions are up for grabs, so to speak. Due to contract structure, intangibles and production; Tyler Ennis, Jason Pominville, Drew Stafford and Thomas Vanek are all likely to be safe from a trade or demotion to Rochester. As training camp fast approaches the Sabres timetable to get under the cap continues to shrink. Despite the obvious solution (sticking players in the minors), Darcy Regier continues to stand by his strategy of utilizing trades to clear the necessary cap space. Due to that apparent strategy, the rumor mill is back up and running. Everyone’s favorite rumor monger, Eklund, floated the idea of a second trade between the Sabres and Flames. While it is an intriguing notion I doubt that either team could find a workable option. Jarome Iginla is on every Sabres fan's wish list. I say keep wishing. Buffalo currently sits $3.6 million over the salary cap. The Flames are just about $1.5 million under the cap at this time. Given those numbers, I can’t find a may either team could work the payroll. The Sabres top trade prospects are Brad Boyes, Ales Kotalik, Shaone Morrisonn, Jason Pominville and Andrej Sekera. Sekera is the most attractive option based on his cap hit (2.75) and his skill level. Pominville is a close second based on his scoring touch, but his $5.3 million cap hit would require a lot of tweaking in a potential trade. Brad Boyes has a moderate cap hit and a moderate offense return, I wonder how attractive he would be for teams around the league. As for the Flames, there are only a few truly attractive options based on the Sabres’ needs and salary constraints. Rene Bourque, Curtis Glencross, Nik Hagman and Brendan Morrison. Certainly Sabres fans are hoping that the white whale, Jarome Iginla, is a target, but there is no way they could swig the trade based on their current cap situation.